On private water systems, one of the most common causes of corrosion is acidic water. Water that has a pH value of less than 7.0 is considered to be acidic. Signs of acid water are corrosion of fixtures, pinhole leaks in plumbing, and blue staining (from copper pipes) or rust staining (from iron pipes). Often these waters are great for drinking or household use, but are low in buffering calcium minerals, and contain dissolved carbon-dioxide gas, which can cause a low pH and acid condition. Without treatment, these waters can be contaminated with copper, lead and other metals from piping, fixtures and appliances, turning good water into contaminated drinking water. Treatment is accomplished by neutralizing the water with the use of an automatic neutralizer filter . 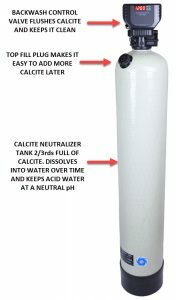 These water filter tanks are filled with a blend of calcium and magnesium carbonates made from naturally occurring minerals, which dissolve into the water, making it less corrosive. In some cases, instead of dissolved carbon dioxide causing the low pH or acidity, the acidity is caused by mineral acids, either natural or from mining or other industrial wastes. Often the pH is less than 5.0. Treating this type of water requires using a soda ash feeder, and in some cases injection of sodium hydroxide. Want to find out how corrosive your water is? Use our Langelier Saturation Index (LSI) Calculator. Cut-away of copper pipe with green corrosion.